La Leche League’s 2014 book, Sweet Sleep: Nighttime and Naptime Strategies for the Breastfeeding Family, is a book for families of infants which focuses on attachment-oriented research evidence and strategies for understanding and addressing sleep challenges. The intent of the book is to provide breastfeeding-friendly infant sleep knowledge, support, and problem-solving and, as I describe below, the authors have succeeded in meeting this aim. Writing in a calm, articulate manner, Weissinger, West, and Pitman are appealing to educated and informed parents who are at least somewhat familiar and open to attachment-based parenting approaches to sleep. Likely the La Leche League publication naturally draws the attention of those already inclined to providing nurturing measures, in general. Although not an academic paper, the level of education required is rather high. The book’s strengths lie in its use of evidence and research balanced with clear descriptions and case studies that highlight the key points. It is quite a lengthy book that takes several hours to read, something that may be a challenge for all but the most motivated sleep-deprived parents. Despite this, the depth and quality of the information and evidence provided make this my new primary recommendation to clients who are keen to read about infant sleep. Unlike other books on infant sleep, this books looks specifically through the lens of breastfeeding. However, it is still appropriate for non-breastfeeding families if shared in a sensitive way to those not currently struggling with breastfeeding or with previous decisions/necessity of weaning. There is enough valuable information to firmly entrench this as an infant sleep book for professionals to consistently draw from when providing eager parents with detailed information or references scientific evidence. Reading this book now, as a weaned mother of three children who now sleep well, I was so excited about the evidence they include that supports attachment-based sleep support for families. In particular, their section on bedsharing (detailing La Leche League’s Safe Sleep Seven principles) is both evidence-based and instinct-focused: you, as a parent, must weigh the information available to you in the context of your own infant, yourself, and your family. The references and citations are the real strength of this book. Subtitles and indexing make it fairly easy to navigate the kindle version. The richness of the content makes it likely that families would benefit from a print version, rather than kindle version, in order to mark particular sections and to use the index more freely. I suspect most families who are so inclined will have print versions decorated liberally with sticky notes. There was a time before kids when I was not as attachment-focused in my sleep approach. And if I am completely honest with myself, there have been times even after becoming a mother where I have struggled with attachment-based approaches to supporting sleep. Shifting my perspectives and expectations this much has been a process. But now, with my youngest at age 4, and with my two older boys, I’ve hit my stride (without perfection, but with calm intention) when it comes to supporting their sleep most nights. Tonight’s bedtime routine (with all it’s imperfections, and bumps) feels like a story worth telling, in that it reflects how profoundly I’ve shifted my priorities around night time parenting. I don’t dismiss the importance of sleep (enough of it, and of good quality). But I do know that more often than not the best way for our kids to get good sleep is to meet (and exceed) the need with an open heart and a calm, unhurried state of mind. Perhaps some nights an open heart and a calm, unhurried mind are a struggle. On those nights it’s a challenge to dig deep and meet the need. It becomes a war against our intentions, which often comes out looking like a battle against our kids: them resisting sleep, and us trying to overpower their resistance. But tonight there was no strong arm, no temptation to coerce, and no resistance. Instead, the evening started with rather feeble efforts on my part to start the routine, and ended with a sense of such connection that I am smitten. At the usual bedtime, as I do on nights when I am distracted and trying to get work done, I was verbally guiding my two older kiddos (6 and 9) to bed. But as with so many pieces of parenting, you’ve got to walk the walk….and actually walk with them upstairs! Instead, I was giving instructions about shutting down screen time while tapping on my laptop, and listing off bedtime steps without modelling them myself. Hardly “leading by example”. Now I do know that my children are capable of walking up stairs independently. Of brushing their teeth independently. Of getting dressed independently. Of climbing into bed and crawling under the covers independently. But I have learned well both through research and through parenting experience, that the ability to do something independently is not the only factor in accomplishing a task. Not by a long shot. Coming alongside, and “doing with” are powerful strategies for connecting and accomplishing. So instead of escalating the volume of my voice, getting sharper and snappier and frustrated, I paused, and heeded the call from my spouse to please come upstairs and help usher them to bed (we both play integral parts in the bedtime wind-down) —tonight things weren’t going all that smoothly. There seemed to be a frenetic energy in the upstairs loft (full moon?!). A lot was happening that had very little to do with bedtime. There were push ups and jumping jacks, karate punches and kicks into cushions, building of forts, requests to make elaborate paper plate faces to tape to these “punching bags” (yes that sounds terrific; yes, it will have to wait till tomorrow), and a lot (a lot) of talking. But step by step, slowly and calmly, we made our way to their beds where story time was pulled off the roster but gratitude questions and a review of their day remained intact. By now it was very late and despite having more work to take care of, I lay with them a while, and I closed my kindle (did I say screens shouldn’t be part of bedtime? Direction not perfection! ), and just lay there as my middle child told me elaborate explanations of how things work. He chatted while holding my hand. His volume was louder than usual, and we kept having to remind him that his little brother was sleeping. He talked with excitement and enthusiasm and while he talked he played with my hair. And then, interrupting his story, he requested that I get the detangling brush….so that he could brush the knots out of my hair. Now the old me —before I became a mother, or before we got to a point where I was getting enough sleep most nights to make flexibility and patience easy— would have said no, it’s bed time, good night. But tonight I paused, considered how comfortable and content he was: he was getting one-on-one time with me as he peered at the full moon out his window and lazily shared contemplative explanations of zombies and werewolves. Here was a kiddo whose one-on-one time often gets squeezed out between the needs of his younger brother and the activities of his older brother. The kiddo who sometimes stops talking out of frustration that no one is listening, or that he’s been interrupted again. Here he was chatting to me, connecting with me. So I did what I felt compelled to do: I got the comb, I brought it up, and he combed my hair while talking, while solving dilemmas of his day, while unwinding for sleep. When all the knots were out I said good night, gave the boys kisses, and left. They both fell asleep without another peep. There is something liberating about approaching night time this way. For all the conflict, or upset, or missed opportunities to connect during the day, night time has fewer distractions. Night time is a chance to put a cherry on top of the day, no matter how bad the day has been. Night time could be (and often is!) a stressful, exhausting ritual of resistance when we as parents can be maxed out. But by “finishing strong”, and finishing with connection, I’ve made up for some of the less-than-ideal parts of today. Whatever needs he had not had filled during the day seemed topped up well by my spending this time with him as he lay in bed. And his need for sleep is fulfilled too: maybe not as early as ideal, but certainly as smoothly as I could ever wish for. Snug as kittens: even older kiddos need to feel relaxed and to unwind with parental support sometimes. There is an impression that the two options for helping your infant sleep are to “Cry it Out” or to sacrifice it all. There is a third option: Meet the biological, developmental, and emotional needs of your infant while also meeting your own needs. It may look different than you planned, but you can find a way to do this that feels right to your vision as a family, that feels good in your heart, and that aligns with the evidence on infant sleep. I don't usually focus on school-age issues with sleep --almost all of my focus is on birth to three-- but we have a school-age child in our family, and because we take an attachment- and nurturing approach to sleep, our approach includes his needs, too! Here's the interesting thing, though: I have heard and read a lot on the developmental shifts that happen in, generally, seven year increments. Waldorf philosophy considers age six or seven a transformational age during which children will have a leap in their thinking and emotional development (give or take a year). Developmental psychologist, Jean Piaget, also describes a shift around this age as a leap that affects all areas of development. And this transformation is one that is picking up speed in our 8 year old. So much is changing within him right now. His humour has taken a leap. His maturity and ability to empathize is evolving. His concept of himself, his strengths, and his challenges, is changing. His physical strength and competency is increasing in leaps and bounds. He has a tolerance for doing things he doesn't want to simply because it needs to be done. He is growing his natural tendency to care for his brothers simply because they need him. His leadership abilities are emerging. And also, not least, his sleep needs are changing. We have, up until now, generally gone to bed as a family (with the adults frequently 'rolling ninja-like out of bed and quietly exiting the room' so that we can watch something on TV or clean up from dinner!). But lately, wow! : the entire day will be going so smoothly, and then as they each get tucked in a switch goes off and our eldest begins behaving in ways that are the bain of the 'night time parent'. In short, he is mean, disruptive, and disagreeable. His behaviour becomes what every parent who feels she has coasted through the day on top of her game, dreads: thoughts of "what? Not now. Not at bedtime! We're nearly there!" creep up and parental patience is thin. And it seemed to be happening nearly every single night for several days. After getting over the initial let down that the day is ending like a lion, my mind tends to go to ruling out medical and health issues, because it hasn't been a 'one off' single event. But the wonderful and complicated thing about humans is that we are much more than our physical selves. We are inquisitive, emotional, curious, energetic, intuitive, and social. When problems happen, it could be health-related, but it could be any of these other emotional intangible things, or a combination of them, that cause the challenge, and resolving it requires an open mind. When mayhem became the theme at night, and it was clear that he was having a great day up until then, my husband's attention turned to looking at whether we needed to re-jig our eldest's bedtime. As I type this, it seems so obvious now: he's been going to bed when his brothers do, despite never having needed as much sleep as they do, and up until now, a long Narnia-chapter or two has kept him in bed as his brothers drop into slumber. But something was not cutting it anymore. It was time for a change in perspective. So, we did a bedtime overhaul and changed our approach, and his bedtime, to fit with his own needs for sleep. It's been quite a dramatic improvement. Resistance is Futile: If we are feeling resistant to 'meeting the need' because we feel he is too old to need help at bedtime, we shift back into the mode that we were in when he was little: meet the need, and be flexible. We remind ourselves that we don't always know why our kids behave a certain way, but that we can always be open to doing something different that works better for everyone. "By the Book": We appreciate that his temperament was not laid out in the text book of child sleep. He may feel anxious, or be bringing worries to bed that make bedtime challenging. The 'make a sandwich' concept: Being able to do something independently does not mean always doing it independently. I know how to make a sandwich all by myself but it sure is nice to have help sometimes. "The Long Game": We keep our eye on the long term goal: that sleep, and bedtime, even for an eight year old, ought to be enjoyable, relaxing, and safe so that he continues to have a healthy relationship with sleep (and so that we can enjoy it too, even if it is different than we expected). Things evolve: We don't consider this a step back but simply an evolution, and a basic human condition of not being or feeling the same every day, every year, and at every age. No bad habits: We do not believe that meeting the need will create a bad habit. Sleep routines will evolve, and if they evolve in a direction that we don't like, and that doesn't work (or no longer works) for us, we can change them. If none of the usual 'strategies' are working, consider that it may be an unmet need. Collaborate! Ask our child what may work to solve the problem (but not ask at bedtime, when his ideas couldn't be explored or discussed fully and with patience). Kids are learning to know themselves, and understand their own needs. Being asked to contribute to a solution that they are a part of is powerful --and can be surprising! Practical magic: We divided bedtime -young kids first with one parent, our eldest downstairs doing table top activities (drawing, writing, math: things he enjoys and seems to gravitate to in the evenings). The last suggestion (a split bedtime) is perhaps the most tangible suggestion on this list, but it is not the most important. It is what we came up with to try, and it worked like a charm. If it didn't work, we'd know that all the other ways we were 'thinking' on the problem were going to help in coming up with a workable solution. The split bedtime also took some enticement for the younger two --they wondered why our eldest was downstairs, and what he was doing. So we upped the interest in bedtime routine, introducing a new tuck in routine that focused on each of them individually, and we switched from Narnia to graphic novels about ninjas. So far so good. We also remind ourselves that this is never an end point. Our son will continue to shift and change, mature, and grow. And his needs will change, too. By focusing on problem solving and meeting the need, we know that we will be more prepared for the next challenge. And so will he. If you'd asked me when I first gave birth what kind of night-time parenting my child would need when he was three, I would have guffawed. Three seemed so far away, so hypothetical. And besides, don't all three year olds fall asleep on their own, and sleep all night? The kids I babysat did. Surely it will be bath, book, and to bed, lickity split. More to the point, I really would have had no interest at all in speculating on the sleep of a three year old --I had a newborn baby to contend with!! Fast-forward eight years and three babies later, and my view on preschool sleep needs has evolved quite a bit. We're at the tail end of our 'official real time learning' about infant and preschool sleep, and we've had three very different teachers along the way! Currently, my youngest is three and a half, and I've had a bit to reflect on how sleep needs have shifted for him in the last several months. In the spirit of sharing experiences, I've written down a few observations that I have had around night-time parenting my youngest. We bed-share with our three and a half year old. With a few bumps in the road, my son has generally slept through the night since two and a half years old, if we are there when he stirs. When he sleeps with us, he likely stirs and falls back to sleep without me being fully aware that he has woken up. When he sleeps alone he tends to wake up some time in the middle of the night, upset and looking for us, settling quickly when I join him. However, there are times when I am up far too late (past midnight! ), forgetting all about my OWN sleep needs in my attempt for some quiet 'me time'. Staying up as late as that has had one wee benefit: it has allowed me to see a bit of a trend this spring: at midnight, nearly without fail, my preschooler was waking up enough to call out for me, and would not settle till I am settled in next to him. I knew that this would not happen forever, and I knew that he slept well with me there. I figured, however, that until that happens, midnight is obviously a time that he has been aware of being separate and alone, and has not felt safe or relaxed enough to fall asleep on his own. Most recently, however, as we move towards summer,I have slept in my own bed (at a decent time! ), or stayed up past midnight (oops! ), and have expected to move into his bed around midnight when my son wakes up. This has led to the discovery of another new trend: in the past month or so he generally sleeps through the night with no support or night-time parenting from me at all! As the sun comes up, he wakes, crawls into my bed, and falls asleep: and we get some nice slumber, lots of cuddling, and even a book or two, before we both wake up fully. It is progress like this that gives me confidence that nurturing the need, even when it doesn't fit with my own "Dr. Spock" upbringing, is the way to peaceful sleep. Seeing these changes emerge gradually, I am reminded that independent sleep develops at a pace that is much slower than the frantic pace of our lives in general. It reminds me that no matter how hectic the world is around us, infant and child needs have not changed much at all. They are still the same as in pre-history! If I keep this idea in mind, I can be the parent my child needs me to be, and I feel good about meeting that need. 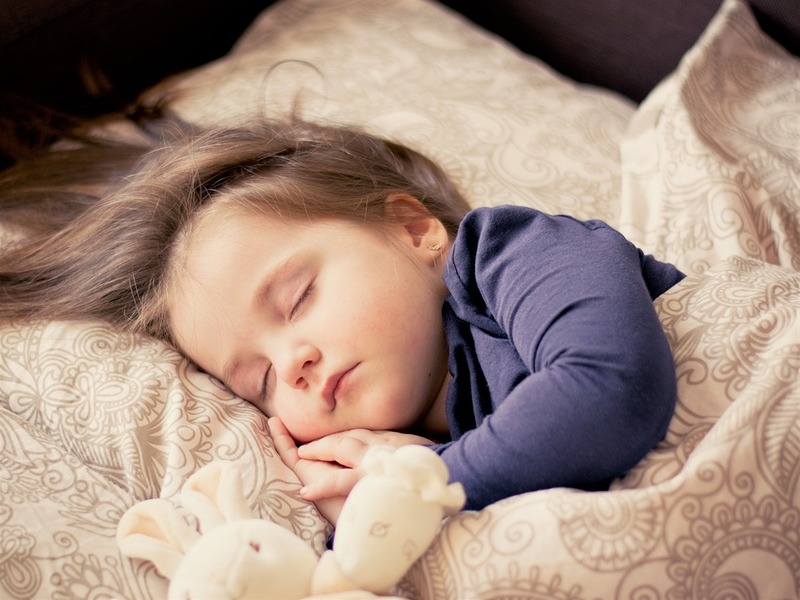 Generally, three and four year olds have stopped napping (but not always, and not consistently! ), and are sleeping 11-12 hours per night. This is 'average', which means that many three and four year olds will sleep more or sleep less than the average, and that it is still OK! Flexibility, especially for those who still occasionally nap, or who fall asleep in the car late in the day, is key. Adjusting bedtime to fit their readiness can be more enjoyable and less frustrating than trying to put a preschooler to bed who is simply not tired. No matter what is going on, routines can help. Having a flow of activities, turning off screens, and keeping noise and activity level lower can help everyone wind down into bedtime readiness. Your chatty, reflective, observant, and aware preschooler may use conversation to wind down at night. Lean into this connection: fighting their nature and their need to wind down can be more frustrating than taking a deep breath and listening to what they are sharing. You might discover some very interesting things about how your three year old thinks! During times of change in sleep needs/timing, it can be helpful to have a partner or other caregiver to help keep older siblings engaged in play outside the sleep space, or to take care of the bedtime routines of older siblings when your preschooler is up later because they napped. There are ways to roll with these changes without a partner, too --it may take more creativity, patience, and flexibility, as well as a reminder of what the long term goals are. Support in one way or another (including chatting to someone who listens and understands) can make a big difference. What works for your family may be entirely unique, even if the values and parenting goals are the same as other families who believe in night-time parenting. If it doesn't work, change it. If you are resentful, over-tired, and frustrated, come up with a new plan. Although any new parenting approach or routine takes a bit to 'try out', do not continue with a failed experiment. Stubborn habits that cannot seem to be changed may actually be needs. True habits are more malleable. If you're hitting a lot of resistance, re-evaluate, and consider changing your approach. Trust your instincts: if you feel sleep may be being interrupted by a health or medical issue, speak with a knowledgeable Health Care Provider. If in doubt, let love rule. Preserve the relationship, even if it means taking time to figure out a bedtime routine that works for everyone.